On a Saturday morning, Calum, a 7-year-old boy with autism and sensory processing disorder, steps into the Empowering Strides arena with Fred, a 1,000-pound paint horse. 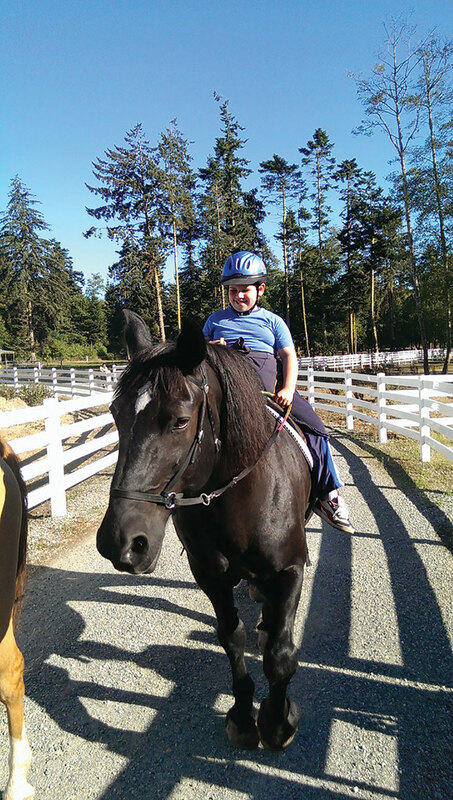 During his weekly lessons at the Woodinville riding center, Calum brushes Fred’s coat, rides and practices skills such as focus, balance and more. Games like this might seem simple, but they help Calum build strength and coordination while learning skills such as following directions. His mom watches from the sidelines, a smile on her face. “Before riding, he used to be this kid who would say, ‘I can’t do this,’ ‘I can’t do that.’ This program gave him a lot of confidence,” she says. Gorcester, who has been working with Calum for two years, says this kind of progress is common. She takes pride in making her program feel like a big family, where Gorcester, volunteers and children all connect through their interaction with the horses. 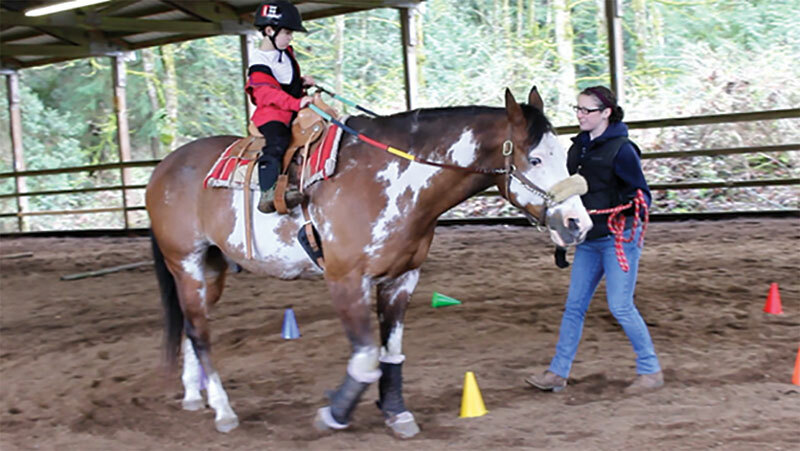 Empowering Strides is one of a growing number of equine-assisted therapy programs around Puget Sound that are benefiting kids with a variety of special needs. While it might seem counterintuitive to mix large, powerful animals and children with challenges ranging from autism to blindness, the size of these gentle creatures is one of the factors that make them ideal therapy animals. For families considering incorporating horses into their child’s emotional and physical development, it’s important to know there are two primary kinds of equine-assisted riding therapy: hippotherapy and therapeutic riding. According to the American Hippotherapy Association (AHA), hippotherapy occurs when occupational therapy, physical therapy and speech language pathology professionals use equine movement to “engage sensory, neuromotor and cognitive systems to achieve functional outcomes.” In a layperson’s terms, hippotherapy is simply occupational therapy, physical therapy or speech-language pathology conducted on horseback. In order for a session to be considered hippotherapy, it must be taught by a licensed therapist in conjunction with more typical treatment strategies. 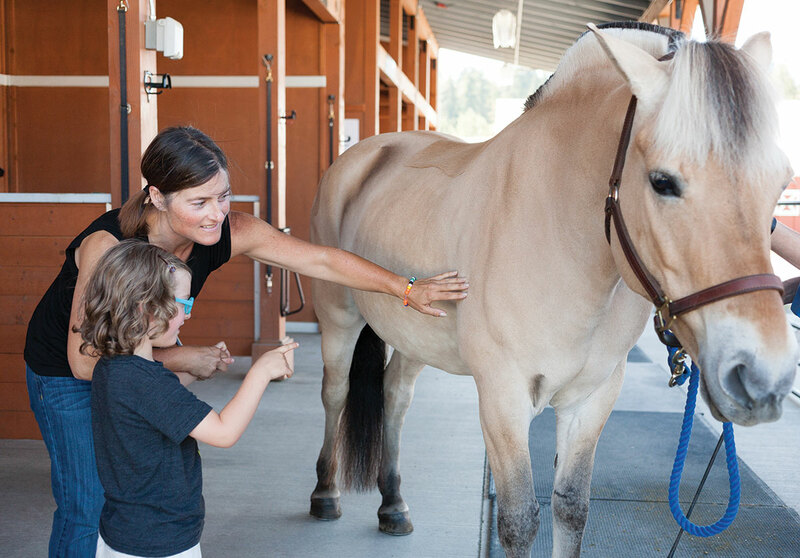 Locally, Redmond’s Little Bit Therapeutic Riding Center is the most well-known provider of hippotherapy services in Puget Sound, and one of the largest such programs in the United States. Therapeutic riding, which falls under the umbrella of recreational therapy, looks more like typical riding lessons, but is carefully designed to address specific physical, emotional and behavioral challenges. It does not require an occupational therapy, physical therapy or speech-language pathology professional, although therapeutic riding instructors also go through a rigorous certification process. Activities for therapeutic riding lessons vary. Kids who need to build strength might practice standing up in their stirrups, while children who need to improve focus might ride through an obstacle course. Lessons often incorporate caring for the horse, which builds emotional connection and a sense of responsibility. How do these large, gentle animals help kids with special needs? From a physical standpoint, riding can help kids develop their sense of body awareness and improve balance, core strength, posture and other mind-body coordination issues. Riding can even help children learn to walk: The rhythmic movements of the horse simulate the walking gait of humans, which can help kids build the balance and strength to take steps on their own. Riding can also lead to improvements in breathing, speech, bladder control and bowel function. Kids also benefit mentally from developing a connection with a social animal known for being responsive to human emotional states. Instructors say that kids can improve their emotional expression and self-regulation, as well as reduce anxiety. Research bears this out, including studies conducted by Ellen Kaye Gehrke, Ph.D., on heart rate variability between humans and horses, whose outcomes point to the mood-boosting effect of the horse. Less tangible, but just as important, is the sense of empowerment children gain. 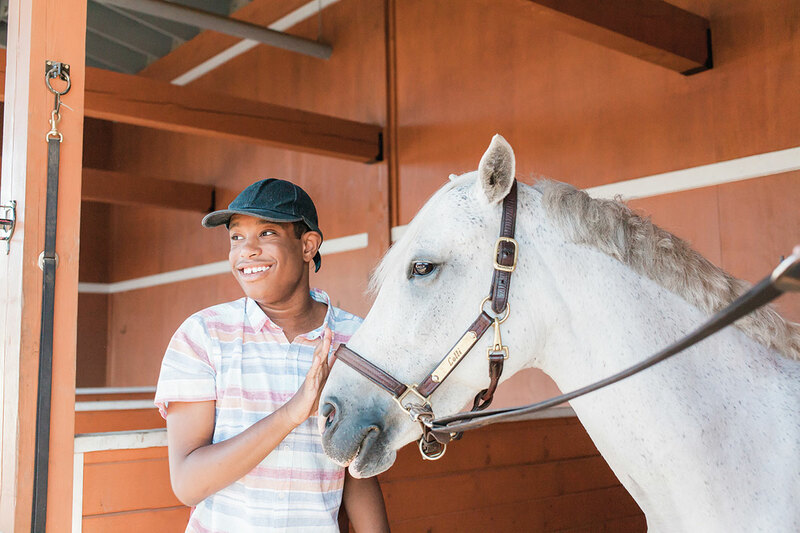 Ali Steenis, a college student who has been visually impaired since birth, has been taking equine-assisted therapy riding lessons at centers including Little Bit Therapeutic Riding Center since she was 5. “My idea of what I was actually capable of changed completely once riding became a central part of my life,” she says. Burk tells story after story of progress — small and large. She has had children who have had difficulty expressing emotions run up and tell her they missed her after a summer break; she’s seen people in wheelchairs go from being unable to sit up on the horse to only needing two volunteers for balance assistance. Burk also speaks of the extraordinary ability of horses to meet the children where they are. Kirbey, one of her lesson horses, is the epitome of a “gentle giant”: He’s a Percheron (a breed of draft horse) with hooves the size of dinner plates who is unfazed by electric wheelchairs. He greets every visiting student with bright eyes and perked ears. Interested in exploring equine-assisted therapy for your child? Find a sampling of local riding centers at right; other resources include certification organizations such as the Equine Assisted Growth and Learning Association and the Professional Association of Therapeutic Horsemanship International. Equine-assisted therapy programs typically list their instructors’ official certifications and note liability insurance, so parents can be sure their child is in safe and knowledgeable hands. You may have to wait for a spot. Little Bit Therapeutic Riding Center, for example, the largest equine-assisted riding center in the Pacific Northwest, currently has a six-month to two-year waiting list for new clients. Fees at centers vary, with therapeutic riding lessons starting at around $50 an hour. Many centers are nonprofits and some offer classes at a nominal cost, with scholarships available. Hippotherapy may be covered by insurance.